Over 2,000 people donated a total of £110,000 for the charity. "We have already started putting the fundraising to work. Over £50,000 has gone directly to our member charities to fund their vital local services. " Over 500 people in the mortgage industry have helped raise £110,000 for End Youth Homelessness by taking out in last November's Mortgage Sleep Out. With 25 events spread across 20 different UK regions and 40 different companies taking part, #mortgagesleepout made it into the top 10 UK Twitter trends with 1.5 million impressions on 30 November – the day that most sleep out events took place. Nick Connolly, managing director at End Youth Homelessness, said: “Rob Jupp, CEO at Brightstar said the mortgage industry would raise £100,000 to help End Youth Homelessness and it did. 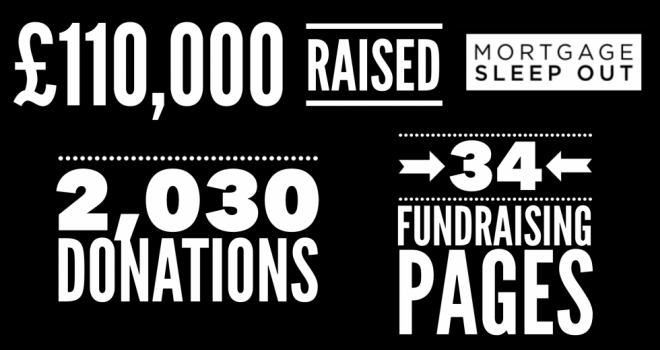 In fact, we surpassed our target with a total of £110,000 raised so far. This figure means that we can assist every young person who approached a local authority for help with homelessness last year. We hope this brilliant effort will inspire other industries to commit to working collaboratively to End Youth Homelessness." Rob Rees, corporate development manager at End Youth Homelessness, added: “We are so grateful for the entire Mortgage Sleep Out community raising such incredible sum of money. This will transform the lives of homeless young people across the UK. "We have already started putting the fundraising to work. Over £50,000 has gone directly to our member charities to fund their vital local services. These services support young people on every step of their journey from homelessness to independence. Our Members give young people safe accommodation to call home, specialist health support and access to education, employment and training pathways. All of our Member Charities receiving funds will also be introduced to their local Mortgage Sleep Out businesses, forming strong local partnerships which can continue to support our young people in 2019 and beyond.